There are two great ways to give the gift of Williams Fresh Café! 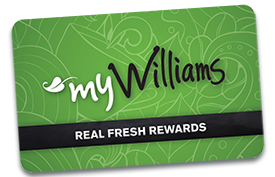 Simply stop by your local Williams Fresh Café and pick up a Gift Card in person. We’ll load up the card for you and put it in a sleeve to make gift giving easy. Purchase an eGift online and the recipient will receive it instantly via email. You can personalize the message and choose from a wide selection of pre-set amounts. E-Gifts are redeemable at any of our restaurants across Ontario. Register your card to start earning 5% cash back. Receive exclusive offers, including bonus rewards on the menu items you love. Already a myWilliams member? No problem. Login to your account to add your Gift Card to your profile and transfer your balance & rewards. Register your card to protect your balance, view your transactions and earn rewards on your purchases. As an account holder you will also be the first to know about special offers and promotions.